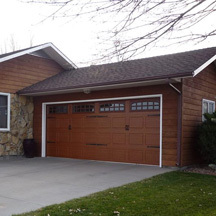 Since 1981, Perfection Door Company has strived to provide the best garage door products and service in the northern Colorado, western Nebraska, and southern Wyoming state area. We pride ourselves on providing contractors and homeowners with the highest quality garage door products at reasonable prices. Our residential and commercial products include sales, service, and installation of garage doors and garage door openers. We also specialize in handcrafted carriage house doors. Visit the Raynor section of this site to learn more. At Perfection Door Company, we stand behind each door we sell and will proudly furnish the best products available to meet your project requirements in a timely manner. Our experienced professionals will outfit you with the right garage door for your application and will accommodate nearly every service need. For more information about Perfection Door Company—and the value we can offer to homeowners, homebuilders, business owners, and contractors—we invite you to view the many products and services profiled within this website. Better yet, stop by our showroom at 315 North Front Street to see our wide variety of sample doors and operators in person. For directions or additional information, contact one of our experienced representatives at 1-800-748-1554.